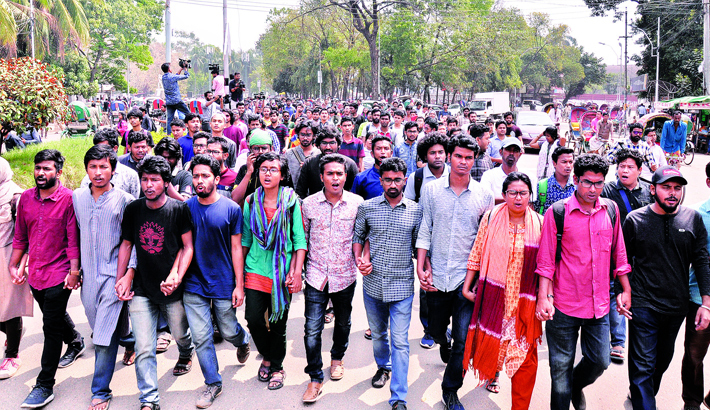 The five panels of students that boycotted the DUCSU polls laid siege to the Dhaka University’s vice-chancellor’s office on Monday for about five hours demanding an immediate fresh DUCSU election alleging vote rigging. Neither VC Prof Dr Akhtaruzzaman nor any of his representatives responded to the protesters. They even did not meet the agitating students. The panels came up with a set of five-point demand which includes resignation of all the officials involved in the electoral activities including the university’s VC Dr Akhtaruzzaman, a fresh poll under the supervision of new body within March 31, withdrawal of cases filed against their fellows and taking punitive measures against the attackers. The protesters brought out a precession from the premises of Raju Memorial Sculpture at around 12:00 am and took position in front of Vice-Chancellor’s (VC) office after parading across the university campus. They also continued their protest yesterday as their three-day ultimatum for a fresh election ended. The protesters, however, announced boycott of the classes and exams as part of their protest but most students attended their regular classes and all other academic activities avoiding there programme. “The university authority completed the election in a restricted way. We told the authorities concerned to make sure of the media access to voting centre but they didn’t pay attention to our demand. We got proof of vote rigging,” said GS candidate from Swadikar Swatantra Parishad ARM Asifur Rahman. He claimed that DUCSU poll wasn’t free and fair. In his address at the protest programme, Bangladesh Student’s Federation (BSF) backed defeated GS candidate Umme Habiba Benozir said: “We protest here rejecting the 11th March election marred by fraud, irregularities and vote rigging. We will hold our position till our demand is met.” She also urged the students to stand against a rigged election and ensure their democratic rights. Independent alliance VP candidate Aroni Semanti Khan, other candidates of different panels and agitators were present at the programme. The university authority, however, now takes preparation for holding DUCSU debut ceremony while most panels protest the polls result. The six strikers who broke their hunger strike after four days demanding reelection to the Dhaka University central student students union (DUCSU) and hall union polls on Monday sat with the DU vice-chancellor. In the meeting, the VC said in previous DUCSU election more irregularities, clash even killing incidents took place but this time the irregularities are normal in comparison with the previous time. On Friday night, seven hunger strikers broke their fast on the assurance that the VC will talk about the irregularities in the election with them. The meeting was held at the Vice-Chancellor‘s office around 11pm on Monday. Progotishil Chhatra Jote members and quota reformists were present in the meeting. “The VC has been informed with evidence about the vote rigging, obstruction to voting and attacking on candidates during elections,” said Shoaib Mahmud who attended the hour-long meeting with the vice-chancellor. The VC said the evidence will be provided to the investigation committee formed on March 13 to probe the allegations into the election. Another participant in the meeting Moinuddin said: we are not satisfied with the meeting. We will wait a few days as the VC gave assurance that they would investigate into the irregularities. A group of five strikers started their hunger last Tuesday evening at the foot of Anti-Terrorism Raju Memorial Sculpture demanding a fresh election as several allegations of irregularities in the DUCSU and hall union elections surfaced. The DUCSU election held after 28 years ended in boycott by all major panels except the BCL over allegations of irregularities and vote rigging. Most participating panels exploded in protests even before the voting ended and demanded a re-election. On the day of election, the university authorities found the proof of vote rigging in Bangladesh-Kuwait Maitree Hall where several hundred ballot papers were found in a sack. All the ballot papers were marked in favour of BCL candidates, source said. The hall provost was removed from duty following the discovery. There was also allegation that in Rokayyah hall students discovered three ballot boxes outside the booth during the election.